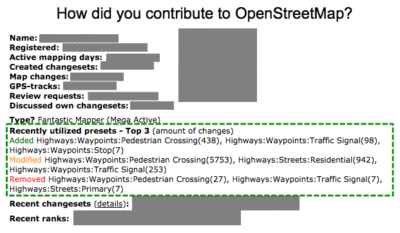 New metric for measuring the “qualitative nature” of OpenStreetMap activities @ How did you contribute ? : Neis One! So I finally started searching in the OpenStreetMap (OSM) wiki for any feasible information about “groups of tags” or “tag categories”. Altogether, I couldn’t discover any solution that fits perfectly to determine the areas of data a mapper contributed in. However, later I got a hint from the JOSM developers to use the presets of the well-known and popular editor. You may ask, ‘What are presets?’ “Presets in JOSM are menu-driven shortcuts to tag common object types in OpenStreetMap. They provide you with a user friendly interface to edit one or more objects at a time, suggest additional keys and values you may wish to add to those objects, and most importantly, prevent you from having to enter keys and values by hand.” You can find many different presets at the aforementioned JOSM page. However, during my data processing I utilized the “default presets”. The XML file contains many combinations of popular or established tag combinations, which contributors use when they are mapping. 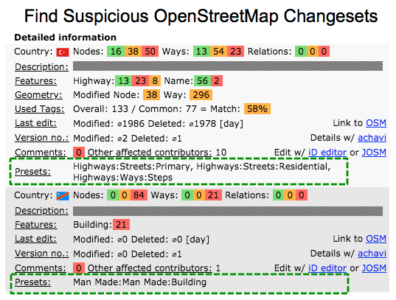 So far so good, as a first step I released a new version of “Find Suspicious OpenStreetMap Changesets“. It shows the utilized presets for each changeset. This can already indicate some quality aspects such as attribute (tag) accuracy or completeness. Now, after some weeks and some minor adjustments, I started to use this collected information about applied presets to expand the metrics of a mapper’s profile. The HDYC-page now also lists which presets the mapper recently utilized during her/his contributions such as adding, modifying or removing map elements. I think this is a really useful next step towards an even more required aspect of quality assurance that we highly need with the OSM project. Some technical details: The database behind the “Find Suspicious OpenStreetMap Changesets” webpage uses the augmented diff files of the Overpass-API. The utilized “default” preset list of the JOSM editor can be found here (Internal Preset list). The entire processing tool was developed with JAVA and uses a Postgres database to store the results. By now, only recently utilized presets of the past 60 days of the contributor’s activity are utilized and presented. However, thank you very much for all your feedback. Hope that it helps. Hi! Great work with HDYC! Is there a public repository available for it btw anywhere? I use my own custom presets. I almost never use the ones that are supplied with JOSM with the exception of the one for buildings. This will make your results for this metric inaccurate. This is a great site. Thanks for your good work. Great tool! Very interesting to see a synopsis of my own work too, I’ve always felt that iD could do with something like this. I would say the naming is slightly misleading. IMHO, only the analysis is done using the presets, it doesn’t say anything about the real use of presets (or JOSM itself).